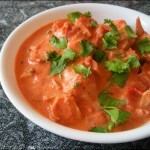 Chicken Tikka Masala is a version of the British food recipe of spiced chicken with gravy sauce. In a blender or food processor mix all marinade ingredients until smooth. Coat chicken pieces in marinade, cover and refrigerate overnight. Roast in preheated oven at 475F for 10–12 minutes, or until done but still moist. Baste frequently with melted butter. To prepare sauce use a blender or food processor and process tomato paste, ginger, garlic, fenugreek, cloves, cardamom, and salt until smooth. Set aside. In a saucepan, melt butter over low heat. 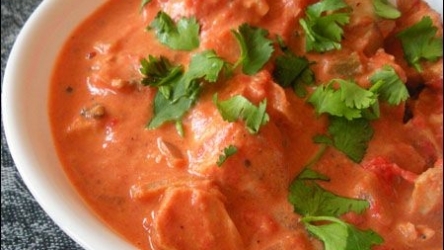 Add tomato mixture and cream and simmer for 10 minutes, stirring constantly. Adjust seasoning and add sugar if too sour.